A versatile sauce that perfectly complements the flavour of white fish and gammon. A mix to make with milk. 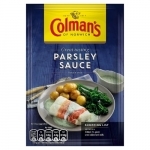 Colmans Parsley Sauce Sachet is an easy-to-use sauce mix that will add a delicious touch to any gammon or white fish-based dish. This handy sauce mix contains no artificial colours, preservatives or MSG.